Happy Friday ladies and gents (sorry this post is going up a bit late!) Not alot went on today - went to work and then had a night in with the boyfriend! So I'd just thought I'd share with you how I had my hair today! I wear this style alot (French plait over my head then into a side ponytail plait) because I find it so quick and keeps my hair in place and out the way all day, so really easy and useful for work! Sorry for the quick and bad quality photo I promise tomorrow and the rest of the 30 Day Snap will be upto standard!! What have you all got planned this weekend? Catch up here, Days - 1, 2, 3, 4, 5, 6, 7, 8, 9, 10, 11, 12, 13, 14, 15, 16, 17, 18, 19, 20. 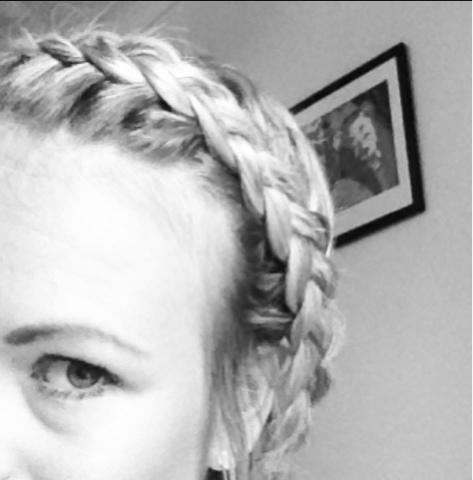 That looks lovely :) I really struggle with french plaits! Cant do them on myself!! 30 days can change a lot, I guess then you must have more pretty hair!